Real estate crowdfunding is a relatively new way for investors to raise money for their deals, or to invest in others’ projects. Crowdfunding for real estate brings about a myriad of benefits, including direct marketing opportunities and growing your investor network. Types of crowdfunding include equity investments and debt investments. Crowdfunding is more than just a 21st-century buzzword; it’s a new, exciting way for real estate investors to raise capital. But how does real estate crowdfunding work? What are the benefits of crowdfunding real estate deals? What do you need to know about looking for real estate investment loans from the masses? And what returns could you get by investing in another investor’s crowdfunding project? Though real estate crowdfunding is not a traditional means of raising capital, it is important for investors to understand this powerful form of real estate financing. Crowdfunding is a way for business owners to raise money, not by asking one investor for a huge investment, but by reaching out to a large pool of investors who each contribute a small amount of money. A key difference between crowdfunding and more traditional methods of raising money, is in the platform used, as crowdfunding is usually done online. Along with crowdfunding websites, business owners turn to social media platforms such as Facebook or Twitter to market their ventures directly to wider audiences of interested investors. Real estate investors have adopted crowdfunding as an alternative to more traditional means of financing investments. For example, large developers are using crowdfunding platforms to solicit investments from groups of accredited investors, while small business owners have launched campaigns to raise funds for smaller investment deals. The section below illustrates why crowdfunding has grown in popularity amongst real estate investors in recent years. Crowdfunding real estate increases your funding options while growing your investor network. Direct marketing through crowdfunding also doubles as a tool to promote your business. Successful projects will lead to positive word of mouth and client loyalty over time. Save time and money by taking advantage of a user-friendly investment platform. Gain access to valuable feedback from your online community so you may address any business flaws. Crowdfunding offers easy access to credit and capital without all of the hassle of getting a loan, and is used for virtually any type of fundraising effort you can think of: personal, familial, business and real estate investing. Investors can benefit by keeping their personal credit free and available for other uses, while keeping their personal credit scores in tact. This allows small business owners to get their companies up and running more quickly, and also help investors secure funding for deals when more traditional options are limited. 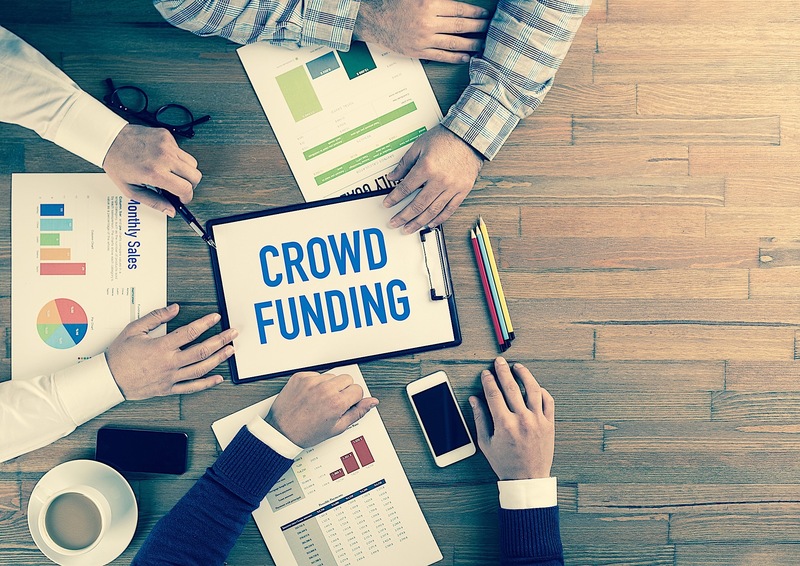 Aside from the direct benefit of funding, crowdfunding lends itself as an excellent marketing tool for business owners who would like to promote their brand. By promoting fundraising campaigns through social media and directly on crowdfunding platforms, real estate investors have an opportunity to rapidly grow their investor network. A best practice is to provide a credibility package on your website, showing past projects and returns, along with your company’s mission and goals. This helps to demonstrate your credibility and professionality to interested investors. A crowdfunding campaign is a smart way to prove the appeal and financial viability of an idea or project. By providing compelling information through the campaigning process, you can attract potential investors and garner support. Once you’ve secured your funding, your contributors will become invested in your success, and will go the extra mile to help you succeed. By providing consistent results, your investors will develop a sense of loyalty, which can lead to positive word-of-mouth marketing, repeated business and direct referrals. Many real estate crowdfunding sites make it easy for investors to launch their fundraising campaigns, thus saving them time and money. These platforms are designed to showcase campaigns in a visually appealing manner, while allowing fundraisers to reach a large audience without excessive effort. Be sure to keep reading to discover some of the best real estate crowdfunding platforms available today. Due to the public nature of crowdfunding, campaigns will be subject to reactions, with or without invitation. However, this is a great opportunity for business owners to monitor user comments and gain valuable feedback. For example, pay attention to input left from other experienced investors, or even criticism as a way to identify and fix business flaws. Responding and thanking users for leaving the time to reach out can help you open up lines of communication and develop genuine connections with new contacts. In addition, it is important to recognize that there is a learning curve for those who have not yet participated in crowdfunding. When launching your first campaign, some of this feedback can be a great way to learn how to improve your campaigns in the future. It can also be an opportunity to introduce the concept of crowdfunding to those who are not yet familiar. Up until this point, we have discussed the concept of crowdfunding through the lens of a borrower. Now, let us say that you are a real estate investor who has built up some capital, and now you are looking for ways to grow your wealth a bit more passively. For this type of investor, real estate crowdfunding essentially has two options: equity investments and debt investing. This is the route most crowdfunding investors take, mainly because it provides a higher return than debt investing. However, this also presents risk. Equity investments give investors an equity stake in a residential or commercial property, effectively turning them into shareholders. If you choose to invest this way, your return will be based on the rental income of the property, minus fees needed for the crowdsourcing platform. In the event the property is sold, you will also earn a share of its appreciation value. Payouts are typically sent every quarter. Sky is the limit on returns: You can see (at times) an 18 to 25 percent annual return, with the possibility for more, since equity investments do not have caps on them. Lower fees: You have the option to pay an annual fee to maintain your shares on the property, instead of upfront fees and monthly fees. Tax benefits: Since you own a share of the property, you can deduct expenses on it from your annual income tax (e.g. depreciation, repairs). Riskier: You will be second in line for payouts. If the property does not attain a profit, you will not get any return on your investment. Longer hold period: If you want more liquidity in your portfolio, equity investing is probably not for you. The holding period usually lasts for five to ten years. Debt investing, on the other hand, means the investor (you) are basically the lender to the property owner. You receive a fixed return based on the interest rate of the owner’s mortgage loan, as well as the amount you have invested. Payments are usually given every month or every quarter. And since you are in debt investing, you will be have priority during property payout. Steady returns: You are more likely to predict how much and when you will receive your payout, thanks to how the investment is structured. You may be looking at a potential of an 8 to 12 percent annual return. Less risk: You have less risk with debt investments, since the property owner will be the one to secure the mortgage loan. If the owner fails to pay the loan, you can recover your loss via a foreclosure action. Shorter hold time: Since debt investments are usually done with development projects, the holding period only stretches from six to 24 months. Higher fees: Once you decide to invest, the crowdfunding platform may take a percentage off of your payout. Capped returns: Debt investments are calculated based on the interest rate of the owner’s mortgage loan. As such, your yields will be limited. With a myriad of crowdfunding platforms available, it’s easy to get lost in a sea of options and features. It is recommended that you pick a platform based on site functionality, credibility, documentation, and customer service quality. For starters, you want to stay away from sites that function as nothing more than listing services. Go for platforms that act as a broker-dealer. Additionally, aim to pick a platform that has previous experience handling the kind of investments you’re looking for. Next, you’ll want to look for a site with solid venture capital backing. Since your investment could be locked up for a certain amount of time, make sure you are using a credible platform that will be up and running for a long time. In addition, inspect how the platform conducts their due diligence. Be sure to ask the important questions: What kind of documentation does the platform collect for potential deals? Do they ask companies to provide liabilities or indemnities to investors, should something go wrong? Finally, verify that the platform provides quality customer service. As you’re researching different platforms and ask them your set of questions, you should be able to get a sense of their customer service quality by their willingness to provide the information and assurance that you need. RealtyShares – With a minimum requirement of only $5,000, RealtyShares is a tech-enabled platform that allows borrowers to present their projects to accredited investors. For investors, on the other hand, you can look into a market of pre-screened residential, commercial, retail, and mix-use properties. RealtyMogul – Catering to both debt and equity investors, RealtyMogul also features a $5,000 minimum investment. They put investor protection at tje top of their priorities, making sure all investment opportunities are vetted. iFunding – if you’re looking to invest in commercial retail and single family residential projects, you may want to check out iFunding. For borrowers, the website has professionals who can lend a hand in raising capital for a project. Minimum investment is also $5,000. Patch of Land – This is a peer-to-real-estate lending marketplace that acts as bridge between investors looking for high-yield, short-term investments and borrowers looking for rehabbing funding. Real estate crowdfunding is a rising trend in the investing space, and for good reason. Utilized correctly, it can benefit both those looking to fund investments, and receive funding, alike. As this is a newer trend, be sure to research real estate crowdfunding platforms and mind due diligence when making investments. If you want to try a non-traditional form of real estate investing, it’s possible that crowdfunding could be the key to a new form of investing success.